The history of the Playhouse is a story of friendship, camaraderie, joy, hard work, and perseverance. Since its first production of THE TURN OF THE SCREW, the Playhouse has been blessed with the contribution of 1,402,050 hours of dedicated service from 36,850 extraordinary volunteers. Sunset Playhouseis a not-for-profit community theater organization, incorporated in 1954. In the 1950s, a small theater group from St. Mary’s Church in Elm Grove had been leading a transitory life, performing in different venues. A building fund drive was launched, enlisting the support of the entire metropolitan Milwaukee area. Eventually the theater group managed to buy swampy land, on which stood an old barn. 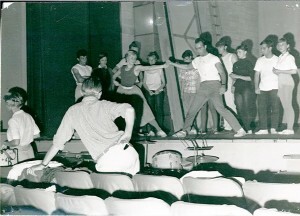 The newly constructed Sunset Playhouse opened its doors in March of 1960. 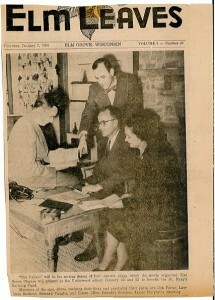 Sunset was the first theater in the state of Wisconsin to be built entirely by a community theater group, but the founders of the Playhouse didn’t have enough money to build the facility of their dreams. While the structure was little more than a concrete box, it was the ticket to providing the levels of quality and service the community deserved. Without having to worry about conflicting with school events or janitor schedules, the new group’s new home would quickly become the bedrock upon which the Playhouse would continue to grow and attract thousands of volunteers. With four additions over forty years, the Playhouse has come a long way since those early productions when the audience sat on folding chairs. 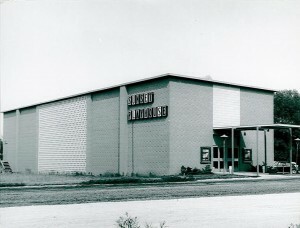 A 1968 addition expanded the lobby, allowing the business office to move out of the basement. 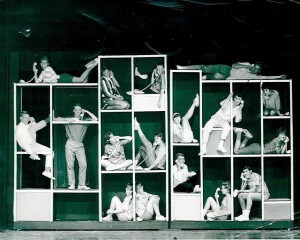 In 1973, the scene shop was able to move upstairs, with a large furniture and prop storage room below. The lobby and offices grew again in 1981 and then, in 1999, with the biggest undertaking since the construction of the original building, a Studio Theatre was added, along with a new rehearsal hall, dressing rooms, catering kitchen, and a completely rebuilt and expanded lobby. Click HERE to view a video on the history of Sunset Playhouse featuring John Dolphin and Mary Furlan.